The NPV function is one of the financial functions. 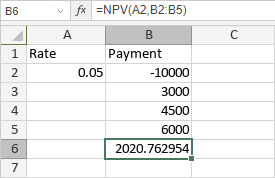 It is used to calculate the net present value of an investment based on a specified discount rate. rate is the discount rate. argument-list is the list of the future payments.